This transmission has been remanufactured at our state of the art facility using the latest advancements in aftermarket technology. We have carefully engineered a process that allows us to maximize performance and stay within a wholesale price range. 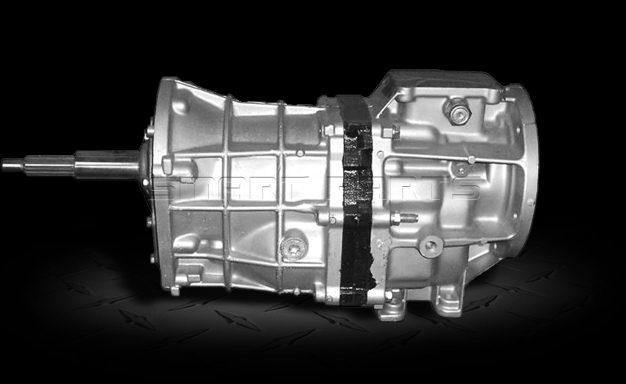 This heavy duty transmission is a direct replacement for Jeep Cherokee, Wrangler, and Comanche Pickup's. This is a manual shift, five-speed transmission introduced in the 1984 XJ Cherokee Jeep, and found in the 1984 to 2006 Jeep XJ, YJ & TJ models. It is a light-duty transmission found behind the AMC 150 2.5L I4 engine. It is also found behind the GM 2.8L 60 degree V6 in the early XJ only. The AX5 has a split case. It is a top shifting, overdrive transmission with the shifter being located in the rear section of the transmission. The AX5 is fully synchronized in all of its gears. The AX5 transmission case is 15-5/8" long with a cast iron plate running through the short distance of the transmission. This transmission has a 21 spline output shaft for connecting to the transfer case. The AX5 was used with an internal slave throwout assembly through the 1994 model year. In 1995 a slave cylinder and cross-arm were used. It has a 14 spline input and the stick out length is 7-1/2".